You’re engaged. Congrats! Now down to the big question, what are you and your groomsmen going to wear? When planning your wedding lewk, there’s obviously more options than ever before. If you’re getting hitched on a beach in Cabo, you may opt for a linen shirt and flip flops. Or maybe you’re taking part in a religious or cultural ceremony that calls for traditional dress (honestly, that just makes your life easier because it’s one less thing to figure out). Bottom line? We’re in favor of you embracing your creativity and the spirit of the day. For the most part, though, this decision generally comes down to two choices: tuxedo vs suit. If this is your dilemma, read on. We’re breaking down the pro’s and con’s of wearing a tuxedo vs suit, so you can make the best choice for your big day. The most obvious argument in the tuxedo vs suit debate in favor of suits for you and your groomsmen? A daytime wedding. Now, again, I understand that it’s 2019! The rules don’t matter! Live your truth! and all that, but we’re talking about a traditional occasion, so we may as well start with tradition. Evening wear (i.e. a tuxedo) is really meant to be worn in the evening. Specifically after 5pm. If your big day kicks off earlier, then a suit is what’s “done.” Again, take that with a grain of salt and live your life, but that’s the most traditional argument in favor of the groom and groomsmen wearing suits at a wedding. Of course, you can wear a suit for an evening wedding as well; you don’t have to wear a tuxedo. If a suit is what you feel more comfortable wearing, then it’s a good choice for you. You want to feel like the best version of you on your big day, and if you feel more “you” in a suit than a monkey suit, then by all means. Wear a suit. 1. Weddings aren’t cheap…for anyone. Newsflash: getting married costs money. As a grown man, you should know what you’re getting into when you say yes to standing up in someone’s wedding. There’s the bachelor party. The plane ticket and hotel (if the wedding involves travel). The gift. If you can’t comfortably afford to incur these costs, there’s absolutely nothing wrong with saying no to being a groomsman. An honest answer of, “I’m excited to celebrate with you, but financially this isn’t something I can do right now” is completely acceptable. Otherwise, groomsmen expect to spend some money, and it’s okay to ask that they wear a suit, even if it means they have to go buy one. 2. Renting tuxedos is dumb anyway. Speaking of money, renting a tuxedo is like pouring champagne down the drain. It’s a waste. And more often than not, a rented tuxedo looks like, well, a rented tuxedo. In my opinion, the first and last time you should rent a tux is your senior prom. We’ll talk about the benefits of buying a tuxedo later, but if you’re choosing between having your buddies wear suits they might possibly have to buy vs. wearing rented tuxedos, we’re having the wrong conversation anyway. 3. Guys get off easy tbh. Real talk: a lotta bridesmaids dresses are generally totally unwearable after the wedding. In fact, I’ve seen a few that were sure to live in the back of the wearer’s closet for the rest of their coral silk taffeta-covered lives. But a suit that fits in a neutral color like navy, gray or black? That can be worn forever. 4. It’s your big day. You get to make the rules. Us ladies are always expected to buy the dress. Get our nails done. And our hair. And our makeup. If the bride gets a cohesive look on her side of the aisle, the groom should expect that his side looks the part of the wedding party, and not just random guests who wandered up front. All you have to do is the suit – that is, unless your nails need some work. The best argument for wearing suits? They don’t have to match. Before you think I’m going all bridesmaidzilla about how groomsmen should wear the same suit (see here for why I don’t like the word “should” at all), I don’t think your buddies need to buy a new suit for your big day. So long as they own one in the color you and your partner have chosen, y’all are golden! 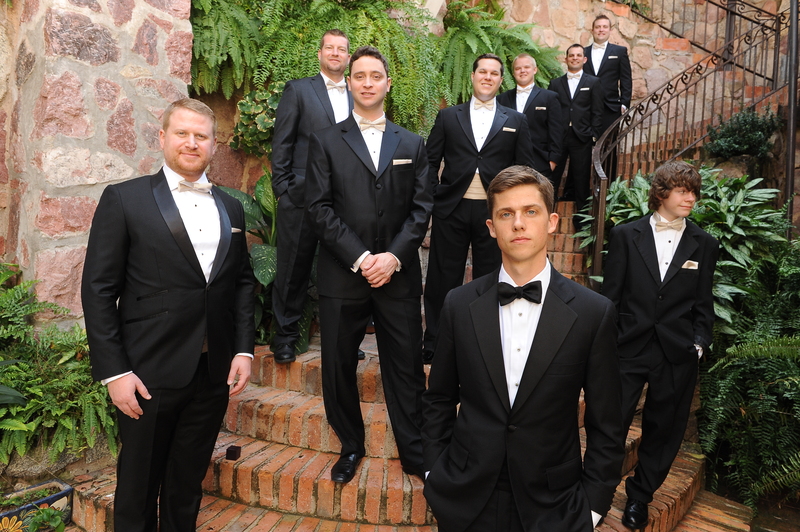 If a groom wants to ask his groomsmen to all wear charcoal suits, great! If you ask your bros to show up in navy numbers, that works! I promise you no one will notice that Brody is wearing pleated pants, while Brady is sporting a flat front trouser. So long as you and your groomsmen are wearing the same overall color, you’ll look cohesive and stylish. If you want to have some control over how the suits look, you could offer to pay for dry cleaning and tailoring to ensure a clean, modern, slim fit. Deciding to go with suits all in one color might result in one or two of your groomsmen still having to go out and buy a new suit. So long as you opt for a traditional color and not, say, burgundy, they’re almost sure to get mileage out of the purchase long after your big day. Don’t count out the power of black tie, guys. A wedding party outfitted in tuxedos can look hella chic, and make you and all your groomsmen feel like motherf*cking James Bond. And when else do you get to cosplay an international mystery and marry the love of your life on the same day?! I asked my friend Jamey, above, who got married in Mexico last fall about his decision to go formal for his wedding. Oh, and do you notice anything? …That’s right, they’re not all sporting the same tuxedo! Jamey didn’t make his friends go out and rent or buy the same tux; he asked them to wear their own if they had one, or procure the tuxedo of their choosing. *He did ask they all be black. It seems reasonable to me that if you want to stand out on your big day in a midnight blue number, that’s okay. If your wife-to-be’s stepbrother wants to set himself apart from the group in a red velvet dinner jacket, that’s not so kosher. How did you and your fiancee decide what the groomsmen would wear? I bought a tux for one of my groomsmen’s wedding a couple years ago, so I stole his idea. Every guy over thirty should have a tux in the wardrobe, right? It also helped that Shelby, my wife, told her bridesmaids to wear one color but they could choose between different dress styles. That opened the door to having different tux styles as well. Did all of your groomsmen have tuxedos hanging in their closet, or did any have to go out and buy (or rent?) one for your wedding? All of the guys that worked in finance had one….three owned and the rest rented. Renting in Mexico was a bit of a mess so they rented stateside and then carried the tux onto the plane. One groomsmen wore a suit despite the repeated emails that we were all wearing tuxedos, but I’m from small town Washington, so….I don’t think people really noticed, so that was fine. Shelby’s brother did have to find one down in Mexico and it was way too big, but he’s younger so it wouldn’t have necessarily made sense for him to buy a tux he’d grow out of. Was there any backlash to the request? Did anyone turn down being a groomsmen because they didn’t want to have to buy a tuxedo? Not at all, guys are easy. The only backlash was having to wear a coat and bow tie in the heat. Luckily the church was relatively cool, and guys were able to find shade before the ceremony. But nobody was upset about having to find a tux. It looks like the groomsmen wore bow ties and pocket squares that matched the bridesmaids’ dresses. I’m assuming those were a present from you, Jamey? What else – if anything – was included in their groomsmen gift? Exactly, part of the gift were the accessories to match the ladies’ dresses. The only downside to matching the color was we couldn’t find any champagne-colored bow ties that weren’t pre-tied. Oh well. The other thing I got the groomsmen were custom-made cigar boxes on Etsy. It had their initials engraved real small next to where they open it. They were delivered from Canada, which reminds me – they’re still sitting in my closet. Wedding season is just about here again; what advice would you give to upcoming grooms about ensuring their big day is both stylish and fun? The same guy that I copied with the tux idea told me the groom is the 28th most important person in the wedding, or something like that. The bride is certainly more important than you. So is the mother of the bride, so is your mother, so is the wedding planner, and so on…so operate with that mindset, and you’ll do yourself a favor. Just like bridesmaids coordinating – but not matching – dresses is trendy now, as long as your groomsmen’s outfits are in the same ballpark, you’re doing good. Jamey’s friends all wore different tuxedos, but you can see from the pictures that the entire wedding party still looks coordinated. Same would hold true for asking your guys to all show up in grey suits, or navy, or seersucker, etc..
A tuxedo will always look appropriate for an evening wedding. Whether you’re knocking down pinatas on the beach at a reception under the stars, or dancing the night away in a hotel ballroom. You really cannot go wrong in a tux. …Unless you rent them. We’ve said it before, we’ll say it again: a tuxedo is a worthwhile purchase for a man to have in his closet! No, it’s not the first suit you’ll buy (or your second, or your third), but it saves you from scrambling at moments like this, when your style game has been called up to the big leagues. And with more affordable options from brands like J.Crew and Suitsupply, you’re closer than ever to your own James Bond moment. Wear your tuxedo with a bow tie. I’m by no means a purist about long ties with tuxedos, but if you’re going to wear a tux, you might as well bow tie it up. And learn to tie one before you get to the wedding. You’ll be the go-to guy with your friends, and they’ll treat you to extra drinks at the after-after party. Getting hitched and need some help? If you’re heading down the aisle, and not sure where you stand on the tuxedo vs suit debate…why not let Team SG shop for you? Let us rescue you from shopping fatigue and sartorial apathy! With our online personal shopping service, you’ll get a personalized shopping plan for your style, your budget, and your body type. We’ll also help you figure out how to wear your new clothes with the things you already own. If you’re ready to save time, energy, and your sanity, give us a shout.